That's so cool that you can see the top links! I love this!! Now, we just need more time in our lives to make all the different treats! Hey Lisa! This week I'm sharing my lemon blueberry bread. Hope you have a great weekend! omg...my mouth is watering just looking at all of the lovely pictures! Mmmm! Thanks for hosting this Lisa! I'm linked up with heart-shaped cut out cookies in two styles: conversation hearts, and chocolate ganache filled sandwiches. Just linked a few of my treats, what a great party! Thanks for the invitation to join your party. Everything looks yummy! I love how festive and beautiful everything looks, not to mention yummy! Good Job everyone! How cool that you can see which links got hit on!!! 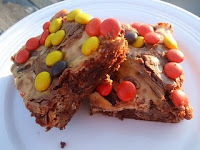 Thank you so much for the shoutout...it was cool that the reeses cheesecake bar came from my site too:-) Thanks for a fun link party! What a fun (and sweet) link. I'll try to be back for the next one. Lisa, everything looks soooo yummy. I am so glad you visited, I almost forgot Sweets for a Saturday! I got mine posted. Yum, I could gain weight just by reading this. What an awesome idea! Thanks for hosting the party! okay.. found one. An oldie but goodie... perfect for a special day.... I've done them a few times now and they are such fun. Hi! I'm a dummy, and accidentally posted my link with my name rather than the food name. It's supposed to be "Lemon Pistachio Biscotti with Lemon Icing." Sorry about that! Thanks for visiting my blog and inviting me to join this party. It's so fun to look at what everyone made! Thanks for hosting, again, Lisa! Will be joining you on a regular basis! Hi Lisa, I've joined your sweets party and I"m loving it. I just linked up Lisa. Great idea. Thanks for hosting! I linked up a Marshmallow Fondant recipe and used it to make Edible Confetti. Hello! Thanks for inviting me:) I've linked up my tart! Too much to choose from!! Hey Lisa, thanks for hosting. Wow, you have had a lot of entries, so many goodies to try. Have a great weekend! Hi Lisa...I've linked mine....:) Thanks!! Everything looks so good! Definitely had to link my chocolate pb tarts so I could join in the fun! Hi again Lisa. Thanks for hosting and thought I would share Bijouxs's Valentine's Day dessert. Hi! I had to set an alarm on my phone to remember, but I finally joined the linky party! 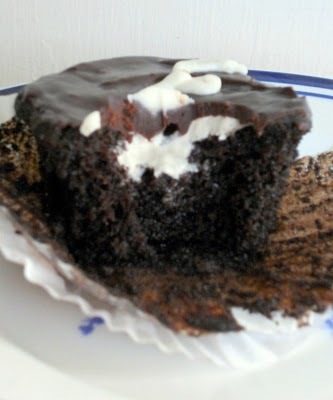 I shared Cakey Banana Bread with Nutella, and Oreo Cupcakes with Oreo Cream Cheese Frosting. I really like that you added the links to the ones you chose from last week!! Looks like everyone has been busy! All the treats looks so wonderful!! I linked up 3 delicious treats (and I already ate ALL of ALL of them!) Sugar Cookies, Amazing Brownie Batter Chocolate Fudge Cupcakes and Hidden Heart Cupcakes with Strawberry Laffy Taffy Icing. Some great recipes linked today! Thank you for hosting!! Great idea and lots of delicious goodies! Thanks for inviting me! Hi Lisa! I think I linked up my blondies correctly :) Everything looks delicious! Hi Lisa! Thanks for your comment telling me all about your lovely site - what a wonderful idea! I hope I've done everything correctly. Everything looks soooo good! Thanks for letting me know about your party, Lisa! Hi Lisa! This is turning out to be the most fun Linky party that I participate in! It is so inspiring to see everybody's great photos and creative desserts. 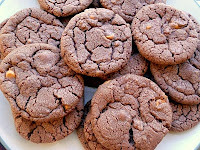 This week I am sharing one of my chocolate cut-out cookies that I just tested (there is a second one on another post). My recipe is gluten free, but it can be made using "regular" flour if you don't have issues with gluten. Hi Lisa! I added mini lemon meringue pies and homemade vanilla ice cream! Looks like this is really catching on! I am so happy to be a part of it! Happy Sweets for a Saturday! Hi Lisa, it was great hearing from you! The chocolate mocha cake is linked up- thanks for all the work you did. Hi Lisa! Thanks for commenting and for inviting me to post! This is a really fun glimpse into the other things people are baking. Love it! Your party is awesome! I just took my entry out of the oven less than 2 hours ago, I think it may still be warm. I brought you my Surprise Bundt Cake today. Hope you are having a great day and thanks for hosting us! Thanks for stopping by my blog and letting know about this. Hey Lisa! I remembered this week! Thanks again for hosting this event! So many wonderful things for Valentine's Day! I added cinnamon rolls. I think I messed up (okay, I know I messed up) - please delete the first one I put on there. I put in the wrong url. Thanks for another great party! Linking delicious, rich Almond Torte! Thanks for inviting me to link up! Love this party! I have linked up! What a great concept - I hadn't heard of it until I read your comment on my post. Lots of great dessert ideas here, can't wait to browse through them. I linked brownies that are soooooo good. I'm happy to discover your blog and plan to visit often. Thanks so much for the invite, Lisa! I've added my lemon ricotta cookies to the sweet treat link party. Great site! What a great party! :)) Awesome recipes and drooling photos!!! Such a great party idea! Except, I don't know how I'm going to get through all the yummy-looking recipes from here that are going on my to-make list! Mmmm! I am going to spend forever here!! Thank you for letting me know!! I've shared again this week. This time blueberry cornmeal muffins. Hi! Thanks for the comment and the link here! I have linked my post to this one! Thanks for the comment! I shared my Chocolate Chip Cookie Bars & my Chocolate Turtle Cupcakes. I left my link (#201) for my Chocolate Truffle Heart Cakes. Thanks, Lisa. Hi there, I just left my link for my lemon ricotta cookies, but when it said "name" I put my name, Melissa. Oops! How do I fix it? Hi Lisa, thanks for inviting me to your sweet treat party & I've linked up my bittersweet chocolate-walnut bundt cake. hi Lisa - So many beautiful treats on one page! Thanks for the invite to such a sweet gathering. Hi Lisa! You invited me "to stop by and link your marshmallows up." I'd like to but I'm not sure how to do this. Please advise. hi lisa. i shared my one bowl chocolate cake. i can't wait to see what other goodies i can find here to add to my 'to make' list! This is a great link party!! SO much fun. I linked up! So happy I could be a part of this! This is an awesome idea There are so many wonderful treats to drool over! I linked the cookies and cream brownies! Glad you liked this cake, it's linked up! I love your linky parties. Thanks for the invite. Lots of great recipes. I have done a lot of baking this week, so I picked a sweet that did not need baking. Rum truffles are delicious. Lisa, this is a fantastic idea. Thanks for setting it into motion. Thanks for the invite, but blur me, instead of name of cake, I've typed in the name of myself. And there seems to an error to the linkage. What should i do? I did the same thing the lady before me did. I put my name instead of the recipe name. Is there anyway to change it to "Chocolate Butterscotch Cake"? Thank you for the invitation. This looks fun! What a fun party! I've linked up, thanks! So many treats, I think I gained ten pounds just looking! Thanks for visiting my blog. I just linked up :) So many awesome desserts on here! congratulations once again Lisa, on the overwhelming turnout! Thanks Lisa for the invite. Fun!!Fun!!Fun!! I already linked up and I'm gonna check the rest of the sweet treats.... Yum-yum!!! Awesome blog!!! OMG Lisa , u are having a wonderful array of delite which am totally on loveee with ...all are fantastic babe! And a super turnout too! The actual whoopie pie pic was not showing in the Linkz so i added the clipart pic ok! Thannxx for inviting me to this fantastic party! Happy Valentines day filled with loveee! WOW, look at all the great recipes here! :-) Thanks for inviting me over. became a follower. Thanks for the invite to link up! Love your blog! Thanks for inviting me to the party -- I put my link up! Thanks for stopping by my blog and inviting me to join in the "party," Lisa! My Thick and Chewy Chocolate Chip Cookies are linked up at http://teamomdal.blogspot.com/2011/02/thick-and-chewy-chocolate-chip-cookies.html. Mmmm!!! Everything looks so good. I can't wait to call on some of these next time I'm in the mood to bake some sweets. Made sure to add a link to my Chocolate Turtle Cookies. Thanks for your visit to my blog. You have a great place here! Hey Lisa! Thanks for the invite to post my links. I posted two that I made this week. Valentine's Day Cornmeal Cookies and the Triple Chocolate Mousse cake. Thanks again, this looks like a lot of fun! Wow! Soo many yummy treeats in one place! Thanks for inviting me to your linky party! Hi Lisa! Thanks for stopping by the Little Kitchen! 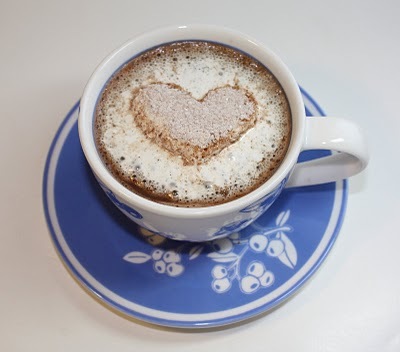 I have added the Cinnamon Heart Cookies and am now in love with your blog!! I am looking forward to reading through it! Have a great week! Come visit us at DinnerTime Ideas & see the rest of the yummy recipes Janis & I have shared. Hi Lisa, Thanks so much for the invite to play along this week! Have popped a link in, here and on my own blog. Happy baking! Hello Lisa, thank you for the invite to sgare my recipe this week. Just linked what I feel are the best peanut butter cookies ever :). Thanks again for the invite :). Thanks for the invite Lisa. I put your link on my blog. I've had a grand time looking at all of these cookie recipes! Thanks for the invite. I have a special weakness for sweets. You should check out my Peach Batter Cake recipe. I have also put your link on my blog! Happy Sweets Day! Sorry I missed it this week Lisa! 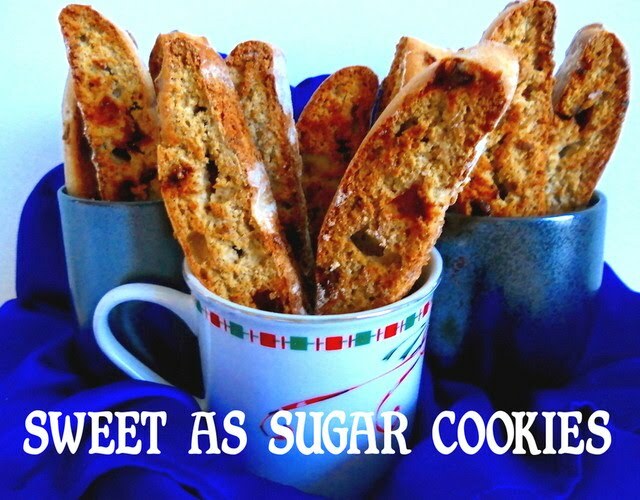 I'll link up with my cookies next week for sure (unless I make another sweet treat by then! ), great party! Thanks for the great news Lisa! I look forward to your Sweets for a Saturday and browsing through all the decadent sweets. You're always the perfect hostess! I hope to share something new on Saturday. Have a great week! Thank you for sharing this useful information with us. Do keep share this kind of blog on weekly basis.